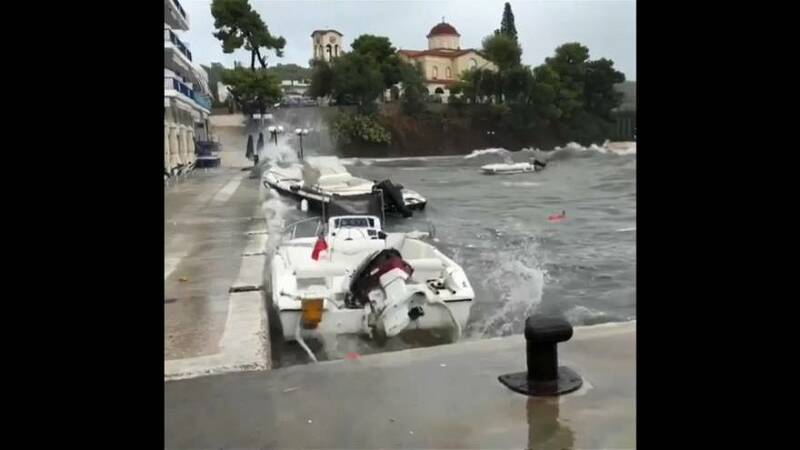 A search and rescue operation has been launched after swirling winds and torrential rain has brought flash floods in Southern Greece. That's according to the Civil Protection Service who say three people are missing. Gale-force winds led to power cuts and falling trees across the country. Firefighters have so far received more than 1,300 calls for assistance to help evacuate people trapped in cars and flooded homes and to remove trees and other debris. Giannis Trafyllis, Civil Protection Secretary says, " The damaged area's will be declared a state of emergency"
The national road is completely closed. The civil protection service warned that northern and central Greece could also be affected and called on citizens to take self-protection measures. This local resident says, "The waves were huge, five meters or so, literally. Terrible situation. We were desperate, terrified." Storm Zorba wind speeds topped 100 km (56 miles) per hour in several areas and were forecast to intensify. Authorities were also concerned that the tropical storm could bring mudslides and floods in the wider Athens area, which was recently hit by deadly fires and flash floods.